The NIU Huskies will take on the Duke Blue Devils in the 2017 Quick Lane Bowl on Tuesday, Dec. 26, at Ford Field in Detroit, officials of NIU, the bowl and the Mid-American Conference announced Sunday. Kickoff for the game at Ford Field will be at 5:15 p.m. EST/4:15 p.m. CST on ESPN. NIU (8-4, 6-2 MAC) will play in a postseason bowl for the ninth time in the last 10 seasons and for the seventeenth time in school history; the Huskies are 4-7 in bowl games since becoming a Football Bowl Subdivision (FBS) program in 1969. The Huskies will face an Atlantic Coast Conference team for the second time in a bowl game — and for the second time this season — as NIU fell to Boston College, 23-20, in the 2017 season opener. The Quick Lane Bowl will mark the first meeting between NIU and Duke (6-6, 3-5 ACC). NIU Head Coach Rod Carey will lead the Huskies into a bowl game for the fifth time as he made his head coaching debut in the 2013 Orange Bowl game versus Florida State. Tickets for the 2017 Quick Lane Bowl are on sale now through the NIU Athletics Ticket Office for $50 each. Tickets can be ordered online through NIUHuskies.com/myhuskies or by calling 815-753-PACK (7225). Any tickets purchased from NIU prior to the end of business on Monday, Dec. 11, will be mailed. After that time, tickets purchased through NIU will be available in Detroit at times and location to be determined. Huskie fans are encouraged to purchase their tickets through NIU. The Huskie Athletic Fund Priority Seating deadline is Friday, Dec. 8, at 5 p.m. Seat locations are assigned based on 2017 annual giving level with Huskie Athletic Fund donors who are also football season ticket members receiving priority before non-season ticket members within their giving level. NIU will offer fan packages for the Quick Lane Bowl through the NIU Alumni Association. For information on available packages, go online to myniu.com/bowl/. Check back as the page will be updated as more information becomes available. 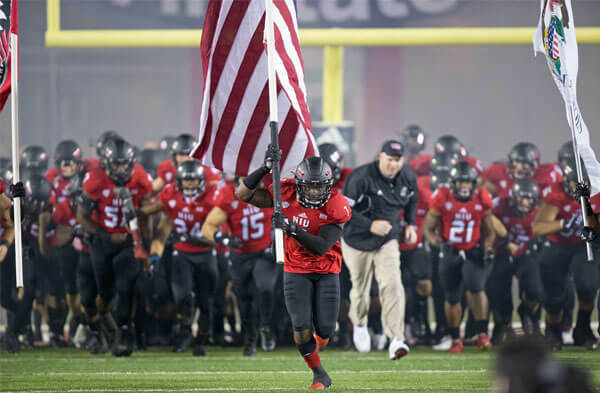 NIU features one of the top defenses in the country, led by one of the most dynamic defensive players in the FBS, MAC Defensive Player of the Year Sutton Smith. The Huskies rank in the Top 25 nationally in nine defensive categories, including rushing defense (11th) and total defense (18th). NIU leads the nation in tackles for loss and is second in team sacks, while Smith, a Ted Hendricks Award finalist and All-America candidate, tops the national charts in both categories. The Huskies’ 2017 season was highlighted by a 21-17 win at Nebraska as NIU became the first MAC team to defeat the Cornhuskers. NIU won its first four league games, including a 30-27 overtime win over Eastern Michigan, behind freshman quarterback Marcus Childers, who was named the league’s Freshman of the Year. NIU is no stranger to Detroit and Ford Field as the Huskies played in six consecutive MAC Championship games in the stadium from 2010-15, winning three. The 2017 game marks the fourth edition of the Quick Lane Bowl, with Boston College, Maryland, Minnesota, Central Michigan, Rutgers and North Carolina the previous participants. The Detroit Lions own, host and operate the game.